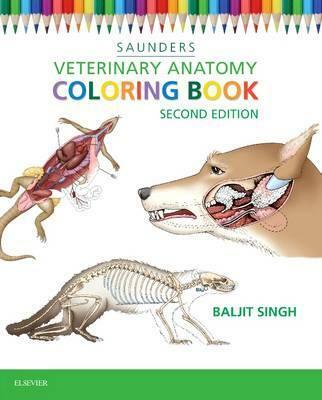 Saunders Veterinary Anatomy Coloring Book includes approximately 300 illustrations to study and color. The coloring book helps you memorize the anatomy content you need to know in both veterinary medicine and veterinary technology and gives you a fun way to review the information you have studied. All illustrations in the book are suitable for coloring and are of the highest quality, created by expert medical illustrators. Organized by body region, the book is divided into sections devoted to the head and neck; neck, back, and vertebral column; thorax; abdomen; pelvis; forlimb; and hindlimb. Numbered lead lines clearly identify structures to be colored and correspond to a numbered list beneath the illustration so you can easily visualize the veterinary anatomy. Plus, you can create your own "color code" using the numbered boxes provided for each illustration. Over 400 easy-to-color illustrations created by expert medical illustrators shows anatomy in detail and makes it easy to identify specific structures for an entertaining way to learn veterinary anatomy. Regional section organization (the head and ventral neck; neck, back, and vertebral column; thorax; abdomen; pelvis and reproductive organs; forelimb; and hindlimb) allows students to easily compare the anatomy of multiple species. Numbered lead lines clearly identify structures to be colored and correspond to a numbered list beneath the illustration. NEW! Section on exotics covers the anatomy of ferrets, rodents, rabbits, snakes and lizards in addition to the anatomy of dogs, cats, horses, pigs, cows, goats, and birds.